BJP president Amit Shah on Tuesday held a massive road show in Tumkur, where his party nominee is pitted against JDS supremo and former prime minister HD Deve Gowda, as the town was swathed in Saffron. Ahead of the road show, Shah visited Siddaganga mutt, a prominent Lingayat seminary in Karnataka, and paid respects at the “Gadduge” (the final resting place) of its highly revered seer Shivakumara Swami, who passed away at the age of 111-year, in January this year. 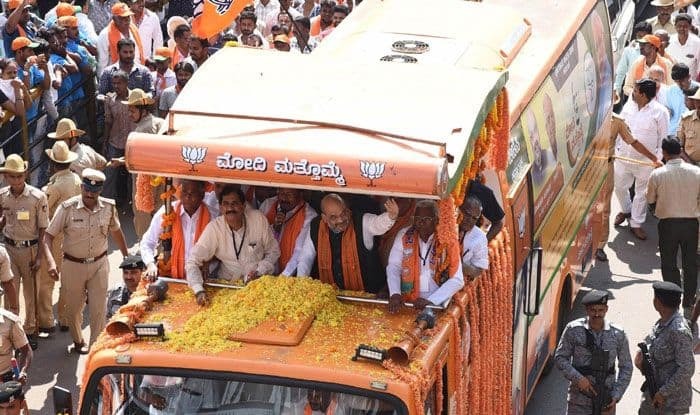 Thousands of enthusiastic BJP workers cheered Shah chanting “Modi, Modi” as his “Rath”, a modified campaign vehicle, traversed through the streets of Tumkur in the around 40-minute road show. Shah canvassed votes for BJP candidate GS Basavaraj on the last day of the electioneering in the constituency, which is going for polls on Thursday along with 13 other seats in the first of the two-phase elections in the state. A large number of people gathered all along the route and showered flower petals on Shah as the “rath” wound its way in a delirious atmosphere. Ahead of the “rath”, BJP supporters sporting saffron caps and holding cutouts, placards and party flags danced to drum beats, as slogans of ‘Modi Modi’ rent the air. The fight in Tumkur is also seen as battle between Lingayats and Vokkaligas – the two dominant communities in Karnataka — to which both Basavaraj and Gowda belong to respectively.